We at The Stewart Law Firm take great pride in being on the front-line in fighting for victims' rights. We handle cases involving catastrophic personal injuries, wrongful death, defective products, and child sexual abuse cases across Texas and the nation. 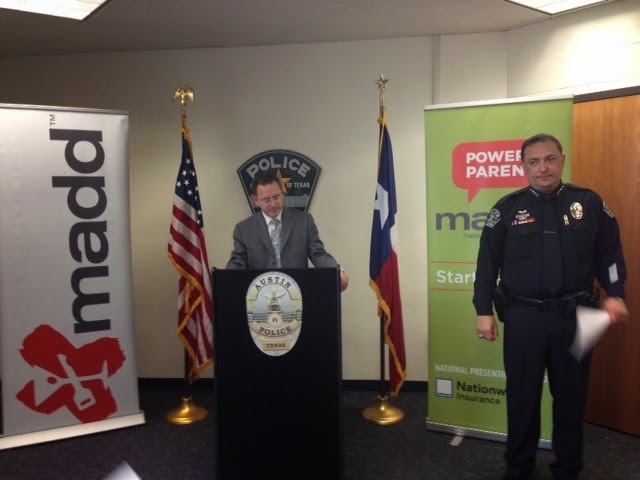 Mothers Against Drunk Driving (MADD) recently held a press conference at the Austin Police Department about Power Talk 21 Day, which is a MADD program designed to empower parents to discuss alcohol dangers with teens. The event was a success, with volunteers from MADD and the community sharing statistics, survey results, and personal stories that show parents can truly make a difference in a teen's life as it relates to the dangers of alcohol and teen drinking and driving. Learn more about Power Talk 21 Day and MADD's Power of Parents program by visiting MADD's website. The Stewart Law Firm is a proud supporter of MADD and its mission to serve those impacted by drinking and driving through education, victim service, and advocacy. Stephen W. Stewart, our firm’s founder, serves as Chairman of the Advisory Board for MADD-Texas. Attorney Stewart was recently honored with a 2013 Star Volunteer Award for services as a Law Enforcement Appreciation Team Member for Mothers Against Drunk Driving (MADD). "It is an honor to have received this volunteer award from MADD,” said Stewart. He states that The Stewart Law Firm is steadfast in the pursuit of justice on behalf of victims of drunk drivers. "Thousands of people each year suffer personal injuries or death as a result of a collision caused by a drunk driver,” he said. “About every 20 minutes in Texas... someone is hurt or killed in a crash involving alcohol. One crash is simply too many. Many of these victims will need real help in order to deal with the resulting physical, emotional, and financial consequences in their lives." Stewart also adds that he "applauds Central Texas law enforcement agencies, MADD, and TexDOT for all of the hard work that they do in an effort to make central Texas roadways safer." The Stewart Law Firm was pleased to be the presenting sponsor of the 2012 Jingle Bell 5K on December 2nd at The Domain in Austin, Texas. The Jingle Bell 5K is an annual 5K run, fun run, family fun walk and a kid run benefiting Mothers Against Drunk Driving (MADD). Hundreds of runners participated in this great annual event. Through this successful event, MADD will continue to provide education, advocacy, and victim services to those impacted by drunk drivers. Someone is hurt or killed in a drunk driving crash about every 20 minutes in our state. Sadly, Texas generally leads the nation in drunk driving incidents. The Stewart Law Firm is dedicated to holding drunk drivers accountable. The Stewart Law Firm was proud to sponsor the 3rd Annual Jam for Justice on October 21, 2012, an annual event for Crime Victims First, which is an Austin non-profit dedicated to serving crime victims. Crime Victims First helps victims of crime through education, victim services, advocacy, and enforcement, making sure that victims are treated with dignity, fairness, and respect. Often, crime victims are forgotten about. The Stewart Law Firm is pleased to support Crime Victims First, making sure that this forgetfulness does not occur. This year's event was special in that Meg Garvin, the Executive Director of the National Crime Victims Law Institute in Portland provided a presentation on the topic of crime victim rights. After the event, Garvin was presented with the 2012 Crime Victims First Stewart Family Outstanding Community Service Award for her tireless efforts to aid and assist victims of crime throughout the Unites States. The Crime Victims First Stewart Family Outstanding Community Service Award is an annual award chosen by Stephen and Ginger Stewart to a recipient who works to help victims of crime. The Stewart Law Firm was a proud supporter of the 2012 Austin Walk Like MADD, a 5k walk benefiting Mothers Against Drunk Driving (MADD) in Texas. This year’s Austin Walk Like MADD event took place at Camp Mabry in Austin, Texas on Saturday, April 28, 2012. Through the generosity of the law firm’s walk-team members and donors, The Stewart Law Firm was recognized at the event for being the “Top Corporate Team” for donations to the walk event. Regarding The Stewart Law Firm’s participation in the 2012 Walk Like MADD event, Attorney Stephen W. Stewart explains that the law firm is steadfast in the pursuit of justice on behalf of victims of drunk drivers. “Thousands of people each year suffer catastrophic personal injuries or death as a result of a collision with a drunk driver,” said Stewart. “The Stewart Law Firm is proud to be involved in such a wonderful event benefiting MADD, which raises funds to help victims and families who are tragically impacted by a drunken driving crash event. Drunk and impaired driving kills almost 17,000 adults, teens and children each year. It injures, often seriously, another half a million people. Many of these victims will need real help in order to deal with the resulting physical, emotional, and financial consequences in their lives. MADD is there to help, providing victim advocacy, education and victim services.” Stewart said that he is most pleased to support this worthwhile event. The Stewart Law Firm, in association with Crime Victims First, a non-profit agency dedicated to serving the needs of crime victims, bestowed a community appreciation award to Mr. Sisto Perez of Austin, Texas. Mr. Perez, a father of 4, was riding his motorcycle in Austin, Texas on February 2, 2012 when he witnessed a motorist strike 3 pedestrians. The driver, allegedly drunk at the time, fled the scene after hitting the pedestrians. One of the pedestrians, a University of Texas student, was seriously injured in the incident. Mr. Perez followed the alleged drunk driver on his motorcycle. When he caught up to the driver, Mr. Perez pulled the driver out of his car, tied him up with a belt and held him until police officers arrived on scene. Being as this incident occurred in downtown Austin, there is no doubt that Mr. Perez’ actions likely saved other lives. About every 20 minutes in Texas, someone is hurt or killed by a drunk driver. The Stewart Law Firm is committed to holding drunk drivers accountable, seeing that victims of this senseless crime receive what they are due under the law. On behalf of Mr. Perez’ courageous acts, The Stewart Law Firm also honored him by giving a cash donation to Crime Victims First in Mr. Perez’ honor. The Stewart Law Firm was once again proud to sponsor this year's Jingle Bell 5k benefiting Mothers Against Drunk Driving (MADD) -Texas. To kick off an early start on the event, The Stewart Law Firm presented a check to MADD - Texas for $5,000.00. Pictured is Stephen W. Stewart, founder of The Stewart Law Firm, Ginger Stewart, and the new Executive Director for MADD -Texas, Debra Johnson. The Jingle Bell 5k took place on Sunday, December 4, 2011 at The Domain, Austin's exciting new shopping complex in North Austin. Stephen Stewart (left) and Ginger Stewart (center) presenting a check to Mothers Against Drunk Driving's new Executive Director for Texas, Debra Johnson. The $5,000 will assist the organizations Jingle Bell Run, scheduled for December 4 at The Domain. “We see in our personal injury practice, first-hand, the magnitude of loss, damage, and destruction that drinking and driving causes, particularly among our teenage and youth populations,” said Stephen Stewart, founder and principal of The Stewart Law Firm. “In all drunk driving collisions, there is one constant truth: all such collisions could have been avoided had someone acted responsibly and not got behind the wheel in an intoxicated state.” Stewart added he hopes the donation helps MADD, the nation’s largest nonprofit that works to protect families from drunk driving an underage drinking, increase awareness across Central Texas. “It is incredibly helpful to receive a large donation well before our event takes place,” said Debra Johnson, MADD’s new executive director for Texas. Stephen W. Stewart, founder of The Stewart Law Firm in Austin, Texas, announced that The Stewart Law Firm was a proud sponsor of the second annual Jam 4 Justice, a benefit concert for Crime Victims First, a non-profit organization which strives to see that victims of crime are treated with dignity, fairness, and respect. The second annual Jam 4 Justice took place on Saturday, April 9, 2011 at Hill's Cafe©, a local eatery and music venue icon in Austin, Texas. The music line-up for the benefit concert included: The Jeff Lofton Quartet; Kalu James; Hector Ward and the Big Time; and Bill Rice. Each April, since 1981, local communities throughout the country observe National Crime Victims’ Rights week by promoting victims’ rights and honoring crime victims and those who advocate on their behalf. The mission of Crime Victims First is to promote and protect crime victims’ rights, prevent rights violations, and improve the treatment of victims and survivors through education, advocacy, and enforcement. The Stewart Law Firm was proud to sponsor the 2nd Annual Jam 4 Justice because it is such a worthy cause. According to Stephen Stewart, many of the clients The Stewart Law Firm serves are victims of crime. More often than not, most crime victims are not aware and are not informed about their legal rights. Under the law, victims of crime have certain guaranteed rights, such as the right to attend criminal proceedings, the right to be heard in criminal proceedings, the right to receive restitution, and the right to be informed in the criminal proceeding, to name a few. Our sponsorship of Jam 4 Justice represents our commitment to see that victims of crime are treated with fairness, dignity, and respect. The Stewart Law Firm is looking forward to sponsoring the next annual Jam 4 Justice event benefiting Crime Victims First so that it can continue to do its great work throughout Texas and the nation. The Stewart Law Firm was proud to support the Austin Police Department's "No Refusal" efforts to curb drunk driving accidents and make Austin roadways safer on New Year's. During APD's no refusal efforts, if a driver is pulled over on suspicion of drunk driving and refuses to do a breath test, drivers are arrested and blood draws are done pursuant to a court order. The Stewart Law Firm was proud to support APD's efforts by providing water and snacks to the hardworking Austin police officers who strive to make our city a safer place to live and work. Stephen W. Stewart states that The Stewart Law Firm was honored to have been a table sponsor for the Make-A-Wish gala event. "The Make-A-Wish Foundation of Central and South Texas deeply enriches the lives of children with life-threatening medical conditions, granting them wishes, enabling them to have fun and enjoy life to the fullest,” said Stewart. “The pride and joy seen in the eyes of children who get their wishes granted is something that you never forget. It is truly rewarding to be part of Make-A-Wish and to assist in spreading joy to those that truly deserve it." the Make-A-Wish Foundation of Central and South Texas is part of the nation's largest and most well-respected wish granting organizations, with chapters and volunteers throughout the U.S. and abroad. The Mission of Make-A-Wish Foundation of Central and South Texas is to grant wishes of children with life-threatening medical conditions to enrich the human experience with hope strength, and joy. Learn more about Make-A-Wish Foundation of Central and South Texas here. Stephen W. Stewart, founder of The Stewart Law Firm in Austin, Texas, announced that The Stewart Law Firm was a sponsor the 2010 Jam 4 Justice, an annual benefit concert/crime victim's rights campaign. The event benefited Crime Victims First. The event took place on Sunday, April 25, 2010 at noon at Scholz Garten, an Austin landmark. Featured performers included The Jeff Lofton Quartet, Hector Ward and The Big Time, and VALLAJO. April is National Crime Victims' Rights Week, marking a time that we honor crime victims' rights and see that they are treated with fairness, dignity, and respect. Crime Victims First's mission is to improve the treatment of victims of crime and compliance with victims' rights through education, advocacy, and enforcement. "The Stewart Law Firm was pleased to be a sponsor of this wonderful event,” said Stewart. “Many of the cases handled by The Stewart Law Firm include cases involving crime victims, whether they are a victim of intoxication assault/manslaughter, child sexual abuse, or certain premises claims. Many of the victims we assist are unfamiliar with the criminal prosecution of those responsible for their injuries, harms, or damages. Having a resource to refer victim clients to, such as Crime Victims First, is great." The Stewart Law Firm was pleased to be a sponsor of the 2010 Austin “Walk Like MADD,” a 5k walk/run benefiting Mothers Against Drunk Driving (MADD)-Texas. This year's Austin “Walk Like MADD” took place on Saturday, April 24, 2010 at Austin's Barton Creek Mall on Capital of Texas Highway/Loop 360. “Walk Like MADD” organizer, Jessica Cullitan, Senior Development Officer with MADD -Texas, and her team of staff and volunteers, did an outstanding job of putting the event together. Thank you to all of the MADD supporters who showed up to make this a memorable and special event. Thousands of people each year suffer personal injuries or death as a result of a collision with a drunk driver. MADD uses the proceeds from its “Walk Like MADD” event to help victims and families who are so tragically impacted by a drunk driver. Stephen W. Stewart, founder of The Stewart Law Firm in Austin, Texas, was honored to receive the National Crime Victims' Rights Week Medal of Honor for his support of Crime Victims First and his outstanding service to victims/survivors of crime. Since April of 1981, communities throughout the country hold annual observances of national Crime Victims' Rights Week by promoting victims' rights and honoring crime victims and who advocate on their behalf. "It is truly an honor to have received this Medal of Honor,” said Stewart. “The Stewart Law Firm is committed to seeing that justice is served on behalf of the victim clients that it has the privilege to represent in matters.” Crime Victims First is a non-profit agency with its mission being to improve the treatment of victims of crime through education, advocacy, and enforcement. The Stewart Law Firm sponsored the 2009 Austin Walk Like MADD, a 5k walk benefiting Mothers Against Drunk Driving (MADD)-Texas. The Austin “Walk Like MADD” event took place on Saturday, May 2, 2009 at Old Settler's Park in Round Rock, Texas. This was the second year in a row that The Stewart Law Firm undertook sponsorship of the Jinglebell 5 K run. The 5K took place on Sunday, December 14, 2008 at The Domain. The Stewart Law Firm is proud to sponsor such a wonderful event benefiting MADD, which raises the much needed funds to help victims and families who are so tragically impacted by such an event. Drunk and impaired driving kills almost 17,000 adults, teens, and children each year. It injures, often seriously, another half a million people. Many of these victims will need real help in order to deal with the resulting physical, emotional, and financial consequences in their lives. Thousands of people each year suffer a catastrophic personal injury or tragic death as a result of an accident involving a driver under the influence of alcohol or drugs. The Stewart Law Firm was a proud sponsor of the Jinglebell 5K benefiting Mother's Against Drunk Driving (MADD), which raises the much needed funds to help families who are impacted by such an event.